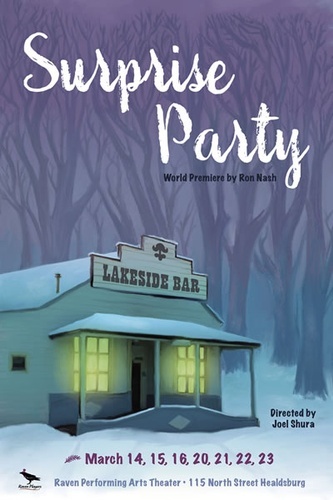 The World Premiere of Surprise Party, written by local author Ron Nash. It's 1943, World War 2, and bigotry and racism are running rampant. Nazi Germany? No. Small-town America. A reporter married to a Jew fights the rise of antisemitism in his community. An insightful look at how the big issues that fuel war are dealt with on a more personal basis in everyday life. A Raven on the Road Production. Performed at Hudson Street Wineries, 428 Hudson St, Healdsburg. Seating is limited. Historic ambience “where the river meets the tracks” at Old Roma Station. We suggest bringing a wrap, as the winery tend to be chilly. Opening Night Bubbly: Join us for opening night of any production and stay afterward for a celebratory toast to the cast and crew! Adults $25 - Senior 65+ $20 - Student w/ID $10 , Thu Value Night Adults & Snr $15.